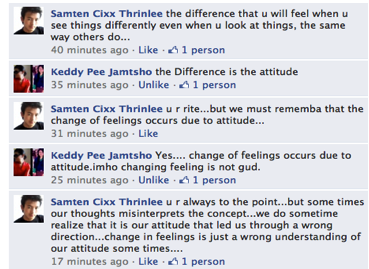 I just came into thought about attitude and feeling when I was exchanging some posts with a stranger in face book. I was quite uncertain how they change the course of human life, or I would rather say how they affect the rhythm of life. Our feelings always follow our attitude. Thus Attitude defines our feelings. It’s our attitude that lets us define that we love somebody while we hate the other. Some times attitude lets us diverge our mind away from the thing that we love. Such things happen when our attitude towards our feelings becomes wrong. We must have good attitude towards our own feelings. Only then things in life run as smooth as one desires it to run. Good and positive attitude always leads to good thoughts and feelings. When we have good feelings we can accomplish great deal of success in whatever we face. Attitude leads to thoughts and thought brings about feelings. Since the root cause is attitude, it’s the basic factor developing a human towards ones thoughts and feelings. The other way round gives us a complete down to the image that we withhold as a human being. Self-image is the creation of ones thoughts and feelings. Without good attitude towards our feelings, things never seem to be accomplished. Things gets even worse when one cannot with hold the negative attitude towards ones own feelings. Whenever you are in conflict with someone, there is one factor that can make the difference between damaging your relationship and deepening it. That factor is attitude. Some one said it right. So keep up with positive attitude always. Cheers your life with positive attitude. The fact that we support our own choice of likes and favorites seems true through the experience that we gain as youngsters. Our choice of likes depends upon our own factors that we include in choosing our best. The fact that some people are fan of Manchester United while others are not explains how people look at things differently. Same thing will appear different to different viewers who, not only look, but also see things differently. Every competition is a great source of knowledge for people who get involved as well as those who just see it. The world gets divided when we have a competing event between two teams. 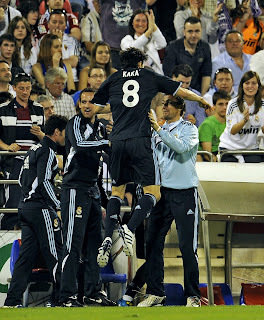 The soccer match is a great example of such instances. Even siblings support their own choice of teams. There is usually a great rush of excitement even if the TV screen isn’t too clear. Thus cheer for your own choice of team. There isn’t beauty without the ugly ones. No champions without losers. And of all there isn’t contentment without sadness. Thus jeering comes along with cheering. Its good to be on our side but being on our side doesn’t always come together with pulling others down. Betting for our choice of team is cool. Everything is good if we know how to interpret in the right way. The only thing we need to do is develop a keen interest in the bet. We must promise ourselves that everything is going to be serious; serious that the bet is worth supporting your choice of team. Once I have had to clean up my whole room. The only reason is betting for my choice of team. It feels good to be clean and I learned to be clean always. Thus it brings good results for those who see things differently. Betting has made a difference in my life, taught me a lesson. Broadened me to be a better being. Thus cheer up for your team. Cheer up for good and do jeer up never. Jeering is the root cause to all the evil. Cheer UP, NO jeers!!! Night gave way into a lovely day as I said, “m off now” to one of my chat mates. It’s already morning without even feeling the warmth of my bed. Cleaned up myself and soon I was ready for the trip. Morning seemed fresh and energetic. Friends seemed more energetic and excited. I tried to be energetic too. The journey towards Tamworth began as we walked towards the train station. Everyone had their share of entertainment and enjoyment till the station. Some sang the sweetest of songs while others talked and had a journey full of laughter. Time began to pull back my energetic moments. Though it was fun travelling in the train for about two hours, all the fun that I had during the journey was just in my dream. “It’s time to get out man”, my seatmate pulled my ear. Then I began to realize that my energy level is almost zero. But I cheered for myself. Whole day was fun roaming and doing some shopping for each one of us. Experiencing new life styles and foods were fun too. And of course the most enjoyable fun that we had is yet to come. Shopping emptied our stomachs and some mates started to complain. By and by stomachs began to complain too. So it’s perfect time that we take lunch. Thai restaurant suited best for us. Welcoming faces brought us the menus for our lunch and we started scanning through the list. Friends were good at choosing and ordering things. Almost all of us ordered for the same item (Chicken Fried Rice). Mates suggested making it VERY HOT with more chilli. The first shot made one of our mates shocked.” It’s SUPER HOT “, all of us laughed with a little bit of guilt within ourselves. We had tough time eating our choice of meal. That was fun though. Lucky for us that we didn’t have to pay for the lunch. It’s the birth day of one of our mates. It’s now time to turn back where we belong. Where we belong temporarily. It’s time to turn back towards our house, away from home. So all of us head back where we actually began. The journey was fun and enjoyable. And the credit must go to the organizers and the gang leaders; our seniors and friends though. As the last dusk of the summer days bent its rays away from my sight,by then i just bade my entire last farewell to those whom i was connected affectionately.Deep down my nerves it was like a quick pain rushing down rapidly as in the spaces between the synaptic clefts.The chilling palpable feelings with cold thoughts struck my every sense. For a middle-class boy from far east holding the dreams of infinite tomorrows,now was ahead of thousand miles into the shoulder-rushing world.I was never ever been painted with the colours of beauty nor adored with sympathy.To be absolute in truth for all of us are bounded,my life wasn't so designed with architect of good companions;in the midst of dark hours i left my marks full of remorse,regrets and threw myself in recklessness. Brought up in a small village between valleys and mountains, i survived all the obstacles of my life just to be me at this moment. I could hardly forget those days when i was a tiny boy with timid eyes hiding behind my dad or my mom. Elders would always tease me for one thing or the other. Its quite embarrassing to talk about my family during those times when we didn't have good clothes to wear. we could hardly get balanced diet. My mom says with a smile on her lips, " you are the luckiest amongst our children. You got what other children are getting. Your brothers and sisters struggled hard to be alive". As she says the past stories, tears rolled down my cheeks but each tear held every responsible thoughts. I began to grow older and more thoughts arose with every tear i let go. Eventually my thoughts grew into my aims and ambitions. I began to realise the struggles of my parents and my siblings. Every sweats from them meant too much for us. I kept everything in my heart though i was too young to help them. I always believed that the time will always come for me to take the responsibilities. I was lucky dat i was the third and the last child to go to school. I didnt like the school life atall. I was always bullied or beaten by my elders for nothing. But i do have roles and responsibilities to play. I struggled hard to complete my primary education. @Cixxsv3N. Picture Window theme. Powered by Blogger.